Genetic analysis for certain childhood brain tumors soon a standard-of-care? An international team of researchers from the Hopp Children's Cancer Center at the NCT Heidelberg (KiTZ), the European Molecular Biology Laboratory (EMBL) and the German Cancer Consortium (DKTK) together with colleagues at the St. Jude Children's Research Hospital in Memphis and the Hospital for Sick Children in Toronto has summarized hereditary gene defects which can trigger the development of certain malignant brain tumors (medulloblastoma). From their findings, the team has derived recommendations for routine genetic screening in medulloblastoma patients. 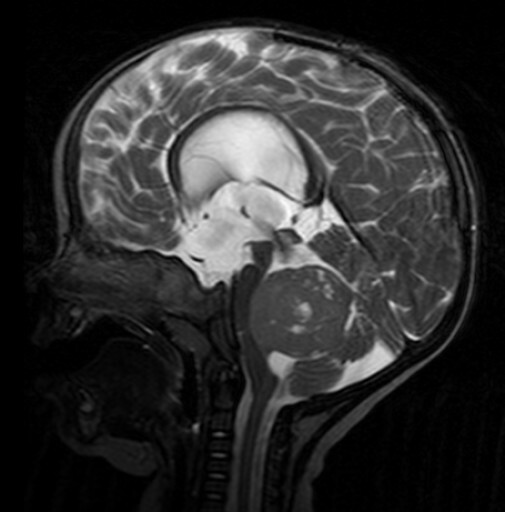 Medulloblastoma is a rare malignant tumor of the cerebellum and occurs predominantly in children. Scientists believe that in many cases hereditary gene defects trigger the development of this malignant disease. However, there are no standards for routine genetic screening of patients, nor are there guidelines and a corresponding nationwide infrastructure for genetic counseling of affected families. Scientists have now been able to characterize medulloblastoma more accurately and to derive recommendations for genetic testing based on analysis of 1022 patients with medulloblastoma. "We analyzed genes that have been previously implicated in predisposition to any type of pediatric and adult cancer", says Sebastian Waszak from the EMBL Heidelberg who is one of the study's lead authors. It turned out that six genes were also frequently affected by genetic alterations in patients with medulloblastoma. Considering the six significantly enriched genes, about five percent of patients had an increased risk of cancer. Taking into account all cancer risk genes, about eleven percent of the patients had an increased cancer risk. Looking at a particular tumor subgroup, the so called "SHH-activated medulloblastoma", even 20 percent were identified to harbour a genetic predisposition to cancer. These predisposing mutations occur in every single cell of the patient and can be also passed on to offspring. "Mutations of this kind often indicate a familial predisposition to cancer and therefore place special demands on the treatment of patients and the counseling of families", said Paul Northcott from the St. Jude Children's Research Hospital in Memphis, who shares the lead authorship. The results are particularly important because both, materials from previous studies and patient data from four current or recently completed clinical trials were included in the analysis. Based on these findings and other tumor features, the scientists developed criteria for routine genetic screening. "Hereditary disease factors usually have a significant impact on the whole family of the patient, We want to make genetic analysis available as a standard of care for patients with specific medulloblastoma", says Stefan Pfister, KiTZ director, scientist at the German Cancer Research Center, and senior physician at the Heidelberg University Hospital. To make this possible, Stefan Pfister and Christian Kratz from the Hannover Medical School have created a registry for patients with a hereditary cancer predisposition and a website that contains information for patients, families, and physicians (www.krebs-praedisposition.de). The project was significantly supported by the German Cancer Consortium (DKTK), the German Cancer Aid, the German Childhood Cancer Foundation, and the Federal Ministry of Education and Research (BMBF). Use is free of charge. The German Cancer Research Center (Deutsches Krebsforschungszentrum, DKFZ) permits one-time use in the context of reporting about the topic covered in the press release. Images have to be cited as follows: "Source: Wikimedia/Hellerhoff".